A PICC line is a long flexible catheter that is used for intravenous (IV) medications or blood draws for an intermediate time frame (1-2 weeks). A PICC line is inserted in one of the large veins (typically in the upper arm) and the tip sits in the large vein near your heart. Why is the PICC Line Insertion radiology procedure Performed? 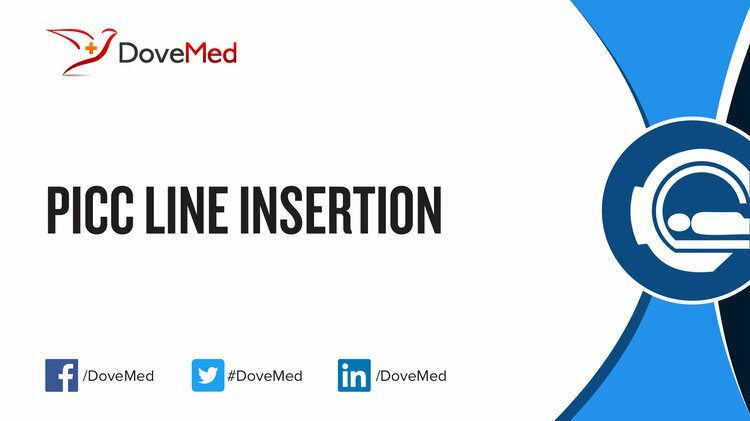 In some cases, a midline (a slightly shorter line) can be used as an alternative to a PICC Line Insertion radiology procedure. Recent advances in PICC lines include specialized coatings, to prevent infection or clot formation within the line. What is the Cost of performing the PICC Line Insertion radiology procedure? The cost of a PICC Line Insertion procedure depends on a variety of factors, such as the type of your health insurance, annual deductibles, co-pay requirements, out-of-network and in-network of your healthcare providers and healthcare facilities. It is normal for a patient to feel uncomfortable and confused with a sudden inflow of information regarding the need of a PICC Line Insertion procedure and what needs to be done. Hudman L, Bodenham A. Practical aspects of long-term venous access. Contin Educ Anaesth Crit Care Pain. 2013;13(1):6-11. https://academic.oup.com/bjaed/article/13/1/6/281092/Practical-aspects-of-long-term-venous-access. Accessed Feb 6, 2017. doi: 10.1093/bjaceaccp/mks039. Moureau N, Lamperti M, Kelly LJ, et al. Evidence-based consensus on the insertion of central venous access devices: Definition of minimal requirements for training. Br J Anaesth. 2013;110(3):347-356. https://academic.oup.com/bja/article/110/3/347/249521/Evidence-based-consensus-on-the-insertion-of. Accessed Feb 6, 2017. doi: 10.1093/bja/aes499. Cheung E, Baerlocher MO, Asch M, Myers A. Venous access. Can Fam Physician. 2009;55(5):494-496. http://www.ncbi.nlm.nih.gov/pmc/articles/PMC2682308/. Accessed Feb 6, 2017. How does the PICC Line Insertion radiology procedure work? The small veins can be damaged by certain medications and the PICC line protects these veins, while still allowing the medication to reach the bloodstream. How is the PICC Line Insertion radiology procedure Performed? A PICC Line Insertion radiology procedure is usually inserted as an inpatient procedure at a hospital. Depending on the institution, typically physicians or specially-trained nurses insert PICC lines. The duration of the procedure may vary, but in general, the PICC Line Insertion radiology procedure should take less than an hour. A radiologist will confirm the proper positioning of the PICC line on a chest X-ray, which is informed to the healthcare provider who inserted the line. A physician will request your consent for the PICC Line Insertion procedure using an Informed Consent Form. What are the Limitations of the PICC Line Insertion radiology procedure? A PICC Line Insertion radiology procedure is not a long-term access procedure; it is generally used for 1-3 weeks. For longer-term access, additional procedures, such as a venous port placement, may be employed. What is PICC Line Insertion procedure? What is expected during the PICC Line Insertion radiology procedure? During a PICC Line insertion radiology procedure, a local numbing medicine is administered, prior to the insertion of the larger needle or sutures. What are the possible Risks and Complications during the PICC Line Insertion radiology procedure? What Post-Operative Care is needed at the Healthcare Facility after the PICC Line Insertion radiology procedure? Following the insertion of the PICC line, a chest X-ray is taken to ensure proper positioning of the catheter. The site of insertion is cleaned and covered with a sterile dressing prior to discharge. What is to be expected after the PICC Line Insertion radiology procedure? Some mild bleeding (spotting on a cloth) or oozing near the insertion site is to be expected on the first day. Individuals, may also notice some bruising and soreness in the area. What Post-Operative Care is needed at Home after the PICC Line Insertion radiology procedure? Post-operative home care is critical to prevent infection in individuals with a PICC line. The PICC Line Insertion radiology procedure does not involve the removal of any body tissue. Who will you receive a Bill from, after the PICC Line Insertion radiology procedure? The patient is advised to inquire and confirm the type of billing, before the PICC Line Insertion procedure is performed.